Neck pain results in a sharp or dull ache in the neck and shoulder areas. 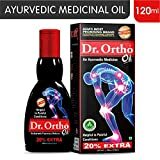 You can find relief with some easy home remedies and use Dr. Ortho Ayurvedic Oil. Exercise can help greatly in relieving neck pain. Doing strengthening exercises and stretching will make your neck flexible, strong and reduce stiffness. Pay attention to what stresses you and sort them out to get rid of neck pain. You can follow relaxation techniques, such as meditation and yoga. The main purpose of the neck collar is to support the neck in bearing the weight of the head when it is healing from the pain. Ice helps to reduce the inflammation in the neck area. The coldness will relieve muscle soreness in the neck. A massage can heal any pain in the body. Gentle massage or rub the aching area to stimulate blood flow. Dr. Ortho Oil will help you to get relief from neck pain. If you liked reading this article – “Home Remedies For Neck Pain”, do like it and share with others. You can share your views with us in the comment box below.